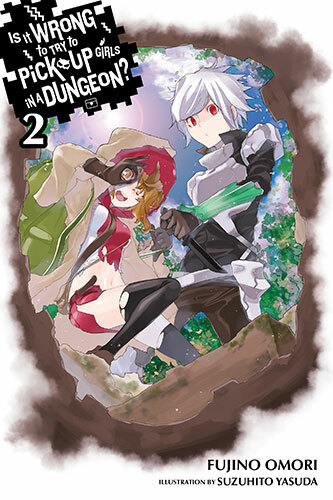 The second volume of Is It Wrong to Try to Pick Up Girls in a Dungeon once again focuses on Bell as he explores the dungeon under Orario and hopes to catch up in power to Aiz Wallenstein, an adventurer who saved his life at the beginning of the story and whom Bell has ultimately fallen for. This volume of our story also introduces a new concept to the world known as Supporters, which for better or worse is certainly a welcome addition. The role of Supporters is to explore the dungeon with adventurers and to shoulder all the potions and items that adventurers collect during their time in the dungeon. Our hero Bell stumbles across once such supporter, known as Lilly, but not everything is quite as it seems. As we dive deeper into the concept and idea of Supporters we quickly learn that the role is looked down upon. Adventurer’s feel they’re much higher in rank than Supporters and thus they often cheat them out of their share of a days money among other things. Lilly is perhaps an example of more badly treated Supporter than others and upon meeting Bell doesn’t quite know what to make of this cheery adventurer who wouldn’t dream of cheating his new friend out of her share of the money or otherwise. He’s dense and an idiot who at first just doesn’t understand that Lilly is out to steal his rare and valuable knife, but during their time together Lilly starts questioning herself which ultimately gives us the second half of our story. Despite all this though volume two of Is It Wrong to Try to Pick Up Girls in a Dungeon does let me down on many fronts. It’s still trying to set up the world, the various characters, and the Familia up that adding in the idea of Supporters just bogs the story down so much that I return to my original thoughts when reviewing the first volume of the series: The stuff to come will be a lot better when the set-up is complete. It’s a bit of a shame that the growing threat to Bell that was introduced in the first volume is barely mentioned at all in this volume, which just reaffirms how much time is spent setting up new ideas. This much set-up certainly isn’t a bad thing for the series as it is just making the world and the characters more likeable, although we are beginning to get to the point where too much more added and it really will feel like Orario should have been a video game world. I want to learn more about Bell’s grandfather and Bell’s life before he became an adventurer, I want to learn a lot more about Aiz Wallenstein and frankly I want Bell to be let loose a bit more and get into more fights and trouble in the dungeon. Frankly Is It Wrong to try to Pick Up Girls in a Dungeon? is at its best when it’s letting Bell loose to really push himself against monsters in the dungeon. This much set-up and focus elsewhere is starting to bring it down and I really hope the third volume begins to resolve my worries as I can see a lot more fun to be had in Orario than what we’re currently experiencing. As with the first volume this second book is really well written and translated. The characters and world are still incredibly and while Bell continues to be a dense idiot, he is most certainly a loveable idiot. This volume also includes an interlude after the second chapter involving a short story based around Bell and his god going on a date, of sorts, it’s a fun offering but it does feel like it takes away from the overall volume. I’d much prefer to have seen it in the third volume, but then given how heavily the idea ties into the fact Hestia being jealous of Lilly and Bell becoming close friends I guess that just wasn’t possible. Once again I had a lot of fun with Is It Wrong to Try to Pick Up Girls in a Dungeon? but the series only has so many more volumes it can dedicate to world building and frankly there is probably only one more before I question my investment into the series. Time will tell if things get better but for now I’m pretty okay with what the series has done so far. Is It Wrong to Try to Pick Up Girls in a Dungeon? is being published in English by YenPress. Two volumes are currently available with the third being released in August. I haven’t quite finished the second volume yet, so my opinion is also somewhat influenced by the anime that I feel is doing a pretty good job of following the novel. I completely agree with what you’re saying about world build up. When watching the anime, I felt that maybe too many episodes were focused on this new character Lilly, when we have yet to really flesh out either Bell or Hestia. According to the novel’s little blurb on Hestia, she’s a failed goddess (back of first novel’s summary). I want to know what this means. I’m also very interested in Bell’s history and his grandfather. Perhaps we are being impatient? I have always had a fixation on main characters in series, so would rather have them be the focus of initial character building than introducing more new characters and fleshing them out. I understand the introduction of Lilly as a plot device to further develop the characters, so the further we read, maybe we’ll understand the necessity of her focus in the second volume? I’m really liking the series thus far and am curious to find out its secrets. Haven’t given up on it yet!